While the 1920’s, with multiple great vintages was a great decade for Bordeaux wine, the same thing cannot be said about the decades of the 1930’s. In fact, 1934 is truly the only good vintage during the decade. That being said, the wine of decade did not come from 1934. The honor of wine of the decade, without any argument is the life changing 1937 Chateau d’Yquem. But I digress. 1934 Bordeaux wine is the result of a hot, dry year. The entire Bordeaux appellation was suffering from a stressful, two month drought when some rain finally arrived in September. The rain was exactly what the Bordeaux wine makers desperately needed. The 1934 Bordeaux harvest was more than abundant. In fact, at the time, it was in contention for being the biggest harvest realized in Bordeaux yet. It was a huge crop. The 1934 Bordeaux harvest started September 14. The picking took place under perfect, warm, sunny conditions. 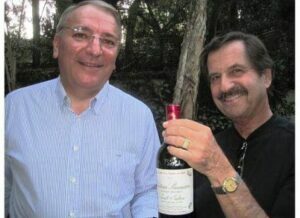 Because my father Don Leve, who is pictured above with Patrick Maroteaux, the owner of Chateau Branaire Ducru with a bottle of 1934 Branaire Ducru was born in 1934, I’ve tried to find as many bottles of 1934 Bordeaux wine as possible to share with dad. I’ve tasted more Left Bank wines than Pomerol or St. Emilion. 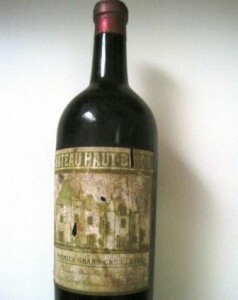 But the 1934 Chateau Cheval Blanc tasted a few years ago was quite charming. 1934 Bordeaux wine with sound provenance has been for the most part sound, silky and very much alive, even as they rapidly approach their 80th birthday. I hope I’m in that good a shape when I’m 80. Perhaps the best two 1934 Bordeaux wines I’ve tasted have been 1934 Latour and recently, 1934 Haut Brion. Sharing those bottles with dad, makes them perhaps the most memorable wines I’ll ever taste Personal memories aside, if well stored, 1934 Bordeaux wine can still deliver a lot pleasure today.